Does Liquor Help You Sleep? Red wine is beneficial for decreasing your risks of lung cancer, heart disease and Alzheimer's disease, plus it could help you fall asleep. People frequently ingest alcohol as a sleep aide. A survey published in "Sleep" in May 1999 found that 28 percent of insomniacs drank alcohol to help them sleep. Sixty-eight percent of insomniacs said that alcohol was effective for assisting them to fall asleep. However, red wine may negatively affect sleeping and dreaming. Red wine not only tastes good and could improve your health, research suggests that red wine helps people fall asleep more easily, according to an article on the Daily Mail website published in June 2006. Grape skins contain the hormone melatonin, which regulates your sleep-wake cycle. Melatonin is also a powerful antioxidant that combats aging and is important for the libido. Your body produces melatonin in the pineal gland in your brain. White wine does not provide this benefit because makers of white wine remove the grape skins. 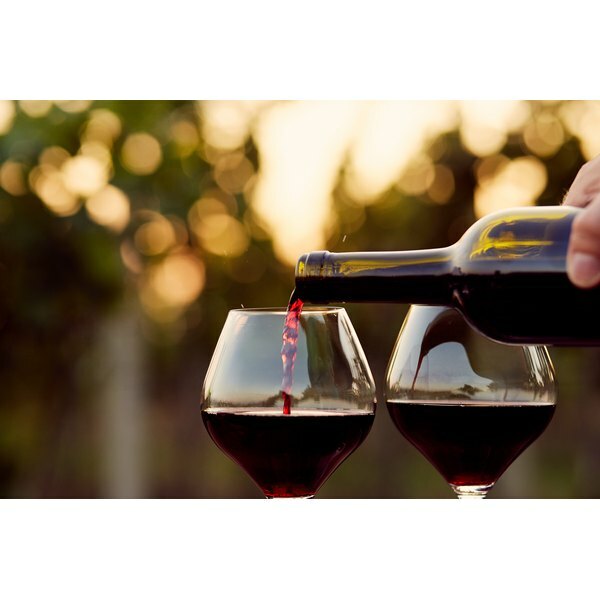 Red wines highest in melatonin include cabernet sauvignon, merlot and chianti. Although drinking alcohol may reduce the time it takes you to fall asleep, it may cause less restful sleep. Your body alternates between two different sleep states at night. The first state is called slow wave sleep because brain waves are slow during this time. Following SWS is rapid eye movement sleep, during which the eyes move quickly. REM is when you dream. Drinking alcohol within the hour before you fall asleep may disrupt the second half of your sleep cycle, causing you to miss periods of REM. It also makes getting back to sleep challenging. Red wine contains a neurotransmitter called tyrosine. Neurotransmitters are chemical messengers in the brain. Consuming tyrosine can make you wake up during the night and cause heart palpitations. Chianti is particularly high in tyrosine. Even consuming wine or other foods that contain tyrosine -- such as tea, aged cheese, fermented meats and chocolate -- in the morning can disrupt your sleep, decreasing your opportunity to dream. Tyrosine perks up your brain and makes you feel hyper. Eating tyrosine-rich foods with carbohydrates can counter the effects of tyrosine and help you relax. Carbohydrates contain tryptophan, which calms the brain. Drinking red wine and other alcohol not only disrupts the second half of your sleep time, it may cause you to have bad or unusual dreams. You cannot experience deep quality sleep until the alcohol leaves your body. Therefore, you may have strange dreams as the alcohol leaves your body and the REM dream state interferes with the deep sleep state that the alcohol was preventing. Also because your body metabolizes alcohol quickly, by the middle of the night it may go through alcohol withdrawal; symptoms of withdrawal include nightmares, sweating and vivid dreams.